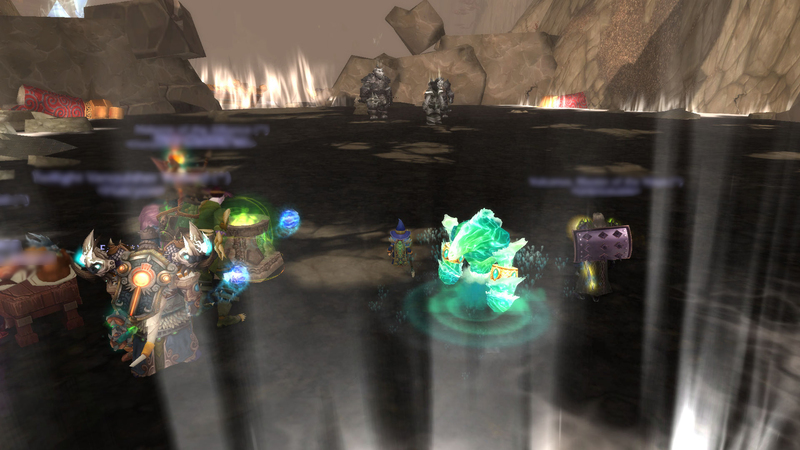 Over at WoW Insider, there was a column called Random Acts of Uberness. The column was basically a shout out to the spontaneous, nice things random people did for another in-game. Recently, there has been some budget cuts at WoW Insider, and this column will be no longer be able to be published. I have decided to try to start a similar column here, at my own blog! Just email me at thefussypants@hotmail.com with your tales of that awesome person, and I will try to publish it here! Be sure to include the name and realm of the person who was uber, and your name too if you want to. Hopefully, I will be able to get the first post up by Monday! 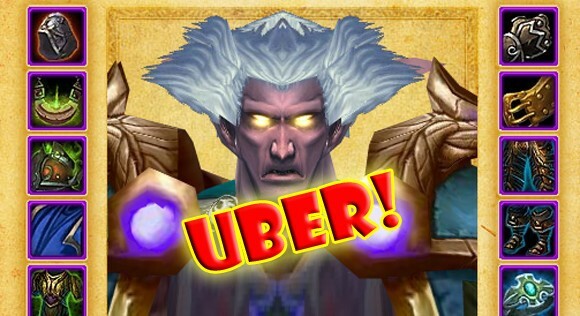 Also, a HUGE thanks to Lisa Poisso, and the other writers who helped make Random Acts of Uberness a thing at WoW Insider. And to all the writers who lost their jobs, I wish you the very best of luck in all your future endeavors!! So, a little while ago, I discovered how to use the WoWhead model viewer to create transmog sets (and to think I’ve been on that site for years now, sigh). I have since created quite a few transmogs for my characters and such, but nothing too serious. Then I saw MoMar’s transmog contest, and I decided to try my hand! The challenge was to created a transmog set for each of the colors of the rainbow, ROYGBIV. February was the red challenge, so I whipped up this little set. I’ve emailed it off, and am now anxiously waiting for the results! Tell me what you think! Personally, I like it and would wear it, but I’m totally curious as to what other people think about it! See that up there? It ain’t that important. This has been bothering me for a while now- people judge on your deeps/heals, and not on your personality. This has always bugged me, but not until recently have I really been bothered by it. The event that compacted the issue happened in a flex raid my guild was running. We, and some random others, were running the first wing and generally having a good time of it. Everyone was getting along, and there were many laughs to be had. Important things to note however, were this. I was consistently the top DPS (this isn’t bragging (much :P) as it is important to the story) and my guild mates were generally in the middle of the pack. We got to Norushen, and had our first wipe. I started to have extremely bad lag issues (3334 latency, woot! ), so I had to restart WoW. Alright, no skin off our backs, we dusted off and tried again. And promptly wiped again. I had died halfway through, so I now was trying to restart my computer to fix the issue. This means I left the voice comm our guild was using too. When my computer finally restarted, it was slow. I got back on the voice comm, and was shocked to hear what had happened. Apparently, the random others had turned against a few members of my guild, citing low dps as a reason to kick them. One member had gotten kicked, but another in our guild had invited them back to the raid. This was our flex raid after all. Then, the randoms started slinging insults at various members of our guild. The person was kicked again, and this time, our entire group left the randoms. I was shocked at how quickly that escalated, and fully expected to log into WoW, having been kicked from the group. It turns out, that because of my high dps, the randoms had waited 15 minutes for me to come back online. I was astounded by their patience, and then immediately upset. Why couldn’t they have been that patient with my guildies? And this is the issue. People value your DPS over your attitude, or willingness to learn. My guildies were friendly and nice (until they were attacked), but because they didn’t have the dps, they were given no patience. I was mostly silent, but had relatively high dps, so they waited a FULL FIFTEEN MINUTES for me to get back. Fifteen minutes! And yet they couldn’t do it for my guildies! It angers me, the things that take priority in peoples minds. Yes dps is important, but just as much so as a positive attitude and a willingness to learn. People need to be WAY more patient with lesser geared people, especially if those people are putting their all. I mean, which would you rather have? The sullen sour shaman who pulls 20% of the deeps, all while putting down the rest of the raid, or the helpful happy hunter, who many not have the best dps, but is doing the very best he can while being polite to others? I know that if I hadn’t been a high dps, I would have been kicked too. No one would have given me tips on how to improve, I would have just been shunted. Because I would have been taking up their precious, precious time (/heavy sarcasm). Patience is a virtue that I think everyone can work on. and gave the man his pay. When you figure out this one, email me the answer to the riddle AND THE TITLES OF THE OTHER POSTS IN THE ORDER WHICH YOU HIT THEM at thefussypants@hotmail.com . Good luck! I will admit, after I got my legendary on my mage, I struggled to find a new goal. As I am an incredibly goal oriented person, this meant that I was barely logging on to my mage or paladin. I had pretty much maxed out the gear I could get on my mage from LFR, had no transmog, mounts, or achievements I wanted to get. I was logging only to do my dailies, and my runs for secrets on my pally. Until I realized something. The feature I’d used to get the Celestials, Other Raids, could be used to do anything from Ordos to Flex Raiding to Normal Raiding. I queued up for Ordos, as I now had another outlet for gear upgrades. I didn’t get anything, but now I had another reason to log on. Then I realized something else. I could queue up for a Flex Raid! It was the day after our guild run, and we hadn’t been able to kill anything, so I was completely fresh. I queue up, and quickly got invited into a group. We had a fantastic time, one shotting the first two bosses. They were extremely patient, and politely explained everything to me, the noob. Eventually, I had to go, but the experience was invaluable as I learned a great deal about flexing. I used to think that LFR was the best addition to the game, but I have changed my mind. Other Raids and Flex Raiding is the new best. The ease of signing up to a mutable raid instance, without an addon is pure gold. Its like pugging 2.0, and I absolutely love it. Now, with my new-found knowledge, I went into our next guild flex way more confident. We managed to fill up way faster with the help of Other Raids, getting started 30 minutes earlier. Then, in the raid, I was able to supply information and possible strats for the bosses I had done. My guild got way farther than we had before, and in shorter time too. The next challenge I gave myself was setting up my own flex raid. With some of my guildies and my dad, we got a group together in 20 minutes. This took place the day after the guild run, again, so we started on Norushen. After a few wipes, we killed him, and then got the Sha (again after a few wipes). So what I’m getting at, is I have a new goal. It’s not finite, like the cloak, but it is most certainly a motivator. I wanna complete a Flex Raid with my guild. And I wanna get all the gear (hopefully an heirloom too!) I can from flex. I wanna raid. Fussypants: As per you, the readers, and my own decision, I decided to get a meter. After a bit of research, I settled on Skada. It took some trouble shooting and forum perusing, but I got my first addon installed with little problem! Oh man, is that thing gonna be addicting. Already, I constantly glance at the numbers I’m doing as compared to the others in my group. I’m gonna take commenter Jack’s advice, and hide it for raids. I’m at 11/20 Secrets on my paladin, and burning out fast. That may be pushed back to a later date, as I am loving my mage. Oh also, it seems we have hit 1000 views. Yay! Yotaan: So, some numbers, heh? Well, Yotaan is 3 out of 12 Titan Runestones – a bit of progress on the legendary. I have played since BC, 7 years of WoW. Absolutely do I refuse to tell you my /played on Yotaan – that number would be frightening! Fussypants: Uh, numbers, lets see. I’ve been playing for 6 years, since BC as well. Um, there are 10 letters in the name Fussypants, and 6 in the name Yotaan. I’ve seen my dad’s /played (*shudders*), and mine is less than a fifth of that. Oh! The sum of all the dragonflights divided by the number of aspects that have gone crazy is… 2.5! Over at WoW Insider, they have a column called Community Blog Topic, which is a chance for the opinions of other blogs to be gathered and published on their site. This week, the question they asked was “Design a new WoW holiday”. Fussypants and Yotaan blogged their answers here! Fussypants: I think we should have more Azerothian lore holidays, celebrating things like the fall of the Lich King and Deathwing, and such. But for holidays like that, I think it should be a little thing, like a few NPCs, and one or two quests. ⦁ Tons of new toys, such as ones that let you swap appearances with the target, or ones that make the target appear naked except for boots and gloves (target would keep the items equip however) and more. ⦁ Random NPCs would be sporadically replaced with mini bosses (like Timeless Isle rares), and would be able to be taken down by the players for a chance at MORE TOYS!! ⦁ Any portals or porting devices would take you to random locations. ⦁ Players would receive mail that would seem to be never before seen mounts or pets, but would turn out to say ‘APRIL FOOLS!’ when learned. ⦁ Going though a loading screen would have a chance to grow or shrink your character for a few minutes. ⦁ Chests would randomly spawn around the world, and opening them would drop either a rare toy, or transform your character into a ‘fool’ costume for 10 minutes. And more! Basically, random world events would happen, all to prank the players, or have the players prank each other. I would imagine that it would only last for a few days, and most of the toys would be available only for the event (but some special ones would be year-long). What holiday would you want? I know there’s a trick to it, but I just haven’t got it yet! Fussypants: I’ve recently got sucked into brawling. Right now, I’m at rank 8, stuck on Hexos (don’t give me hints, I wanna figure it out by myself!). I have to say, I’m enjoying it way more than I thought I would. The first bosses were ridiculously easy, as they should be. I got all the way up to Rank 4 Ixx before I had my first death, and then up to Rank 7, the GG guys, where I got stuck for a while. And I have to say, excepting the first few ranks, the Brawler’s Guild is surprisingly challenging. The fights require strategy, instead of brute force and high DPS. I totally expected to be able to crush with my high (as compared to when the Guild was introduced) ilvl, but I instead struggled on some. I also really loved the sense of community. When I was there, there was always some one else there, and usually, they would encourage, buff, rez, or give tips to me. I actually managed to pass the GG guys with the help of another warlock. The Brawler’s Guild was a fun, and unexpected challenge. I really hope WoD has something like it, and I plan to beat my dad to rank 10! Yotaan: Brawler’s guild, is, for me, one of those things to do that I totally forgot. 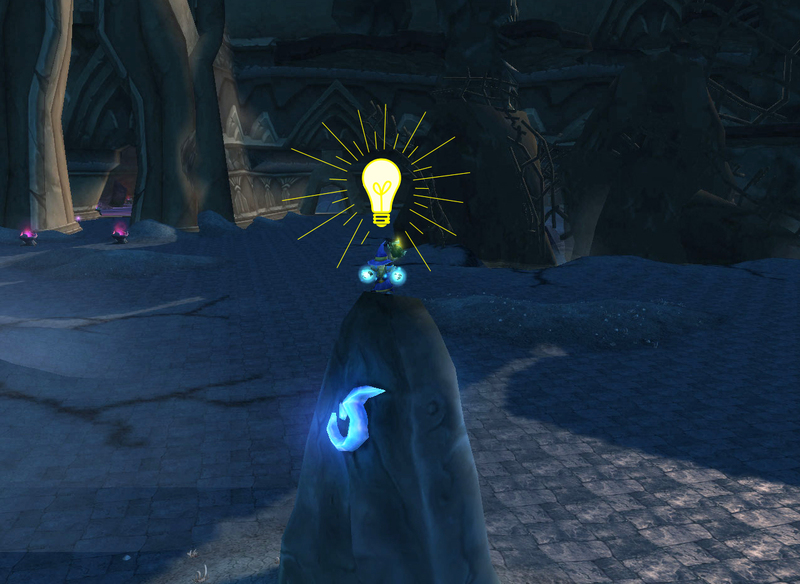 Then, a few weeks ago, I had picked up a quest item where you need to turn it in to try one of the optional bosses. So, I’m thinking I’m a pretty good player. Figuring my PvP experience of responding to challenges on the fly would keep out of the worst of the bad. Boy, was I wrong. The goal was not clear, I think I need to dps some towers in the corner or something and the main boss had well over a million health too! I was flattened almost immediately. Of course, I loved the challenge and changed to another toon and jumped right in. That’s how Fussypants found out about it, she saw my achievements light up. Now, let’s see how far I can get….